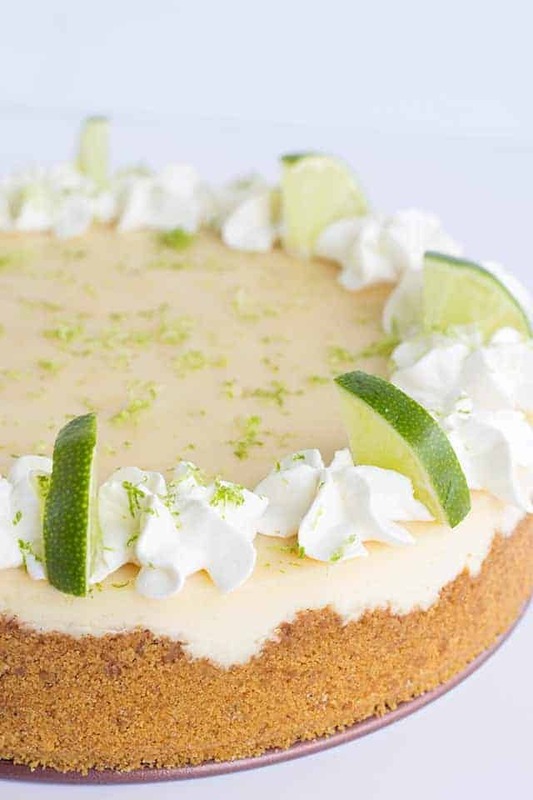 This key lime cheesecake is a fun spin on the key lime pie. It’s so thick and creamy! Did I mention it has the perfect balance of sweet and tangy?! 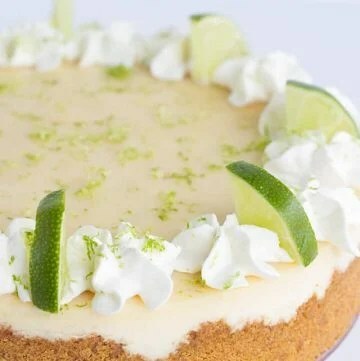 As far as the perfect summer dessert, this key lime cheesecake is the total package. The first time I made this key lime pie cheesecake, I baked it and let it cool in the oven like I normally do. The next day I was anxious to try it out to only figure out that I had never put it in the fridge. I wanted to eat it so bad but didn’t dare. I wasn’t up for a case of food poisoning. 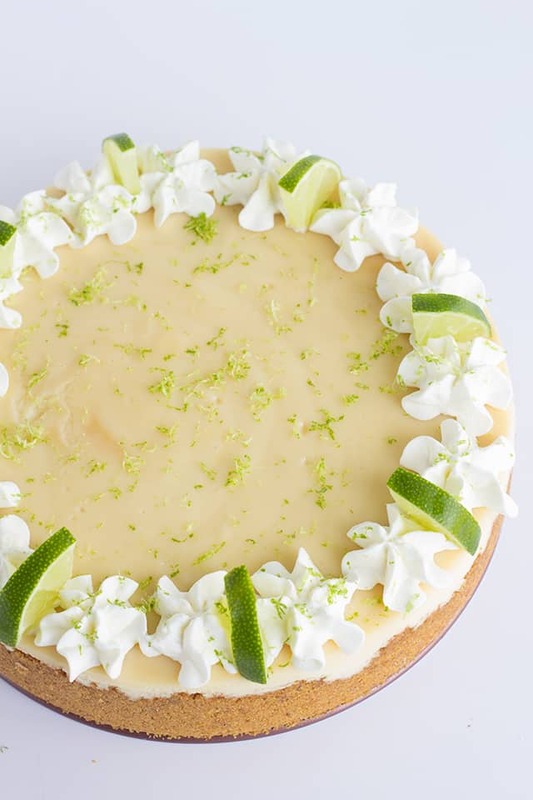 I had even told my friend that I would bring her some of this key lime cheesecake recipe before realizing that it had never made it to the fridge. She was game for still trying it, but I wouldn’t take it down to her. Sometimes you just need to watch out for your friends. Can I just say that I’ve probably eaten worse things at my grandmother’s house though? 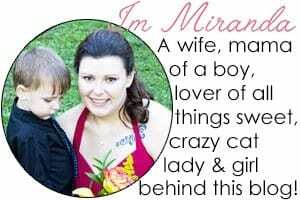 She wasn’t big on expiration dates or putting the mayonnaise away. Is that a grandma thing? Did I just hear a gasp? You’re not going to believe this, but I used key lime juice out of the bottle and I recommend you do the same thing. Seriously. I used Nellie & Joe’s Key West Lime Juice for some time now and it never fails me. I can always find it either on Amazon or at my local Walmart. Key limes aren’t always that easy to come by at least not in upstate New York. I’ve used them but they’re so tiny and hard to find that I prefer the juice out of the bottle. I can’t say the same about lemons though. I did use a regular lie to slice up and zest onto the cheesecake. You may want to grab 2 if you want to garnish your cheesecake the same way I did. What is key lime cheesecake? I took what you would put in a key lime pie and added it to my vanilla cheesecake recipe. It’s a key lime cheesecake with condensed milk in it. I really like the addition of the sweetened condensed milk in the cheesecake. I should use it in my cheesecake recipes more often. Instead of using regular lime juice, key lime juice was used. So what’s the difference? Key limes tend to be more aromatic and have more of a floral juice. Key limes are also much smaller and the peels tend to have a more leathery feel to them. Lastly, you’ll find key limes in the grocery store only when they’re in season. That means you’re not going to find them in the middle of winter. You will, however, find “regular” or Persian limes pretty much year around. Can I substitute the key lime juice with regular lime juice? The answer is if you must. 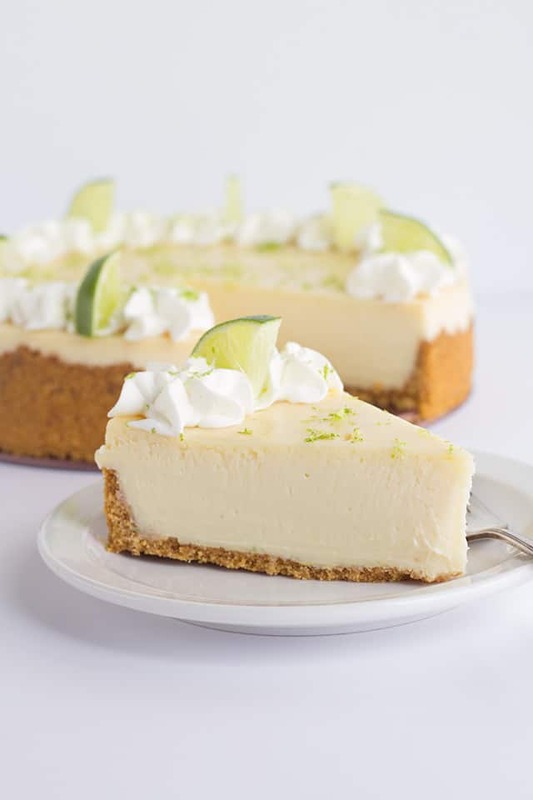 The key lime cheesecake may be more tart with regular lime juice in it, so think about possibly adding more sugar. I haven’t tested it myself though, so I can’t tell you exact amounts or even if you will need it. 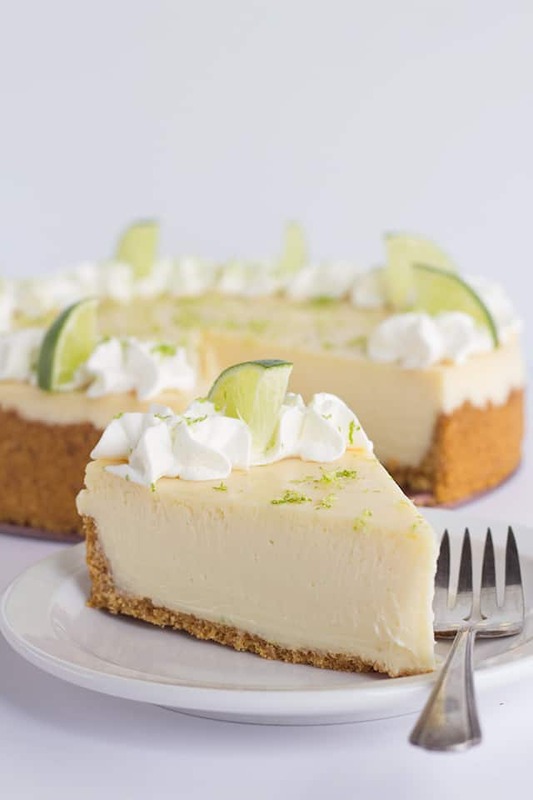 Can you freeze key lime cheesecake? You can freeze any cheesecake. You’ll need to remove it from the pan unless you’ve placed a piece of parchment paper under the crust and greased the sides of the pan to ensure it will easily pop out of the pan once it’s been frozen. If you removed it from the baking pan, place it on a parchment lined baking sheet and pop it into the freezer until it’s firm. Gently push on the cheesecake to make sure it’s frozen pretty solid. Once it’s frozen, wrap it in heavy duty aluminum foil and place it in a freezer bag. I would say the maximum freeze time is 2 months. To thaw it, place it in the fridge overnight. 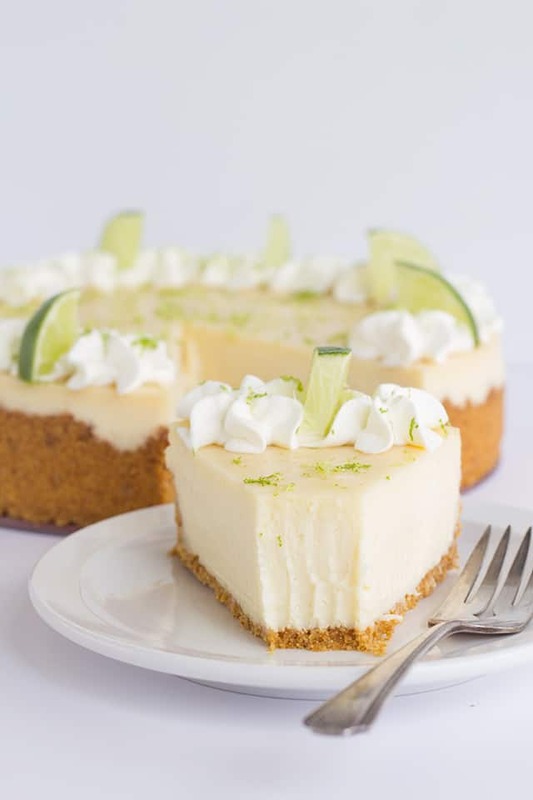 This key lime cheesecake is thick and creamy! Did I mention it has the perfect balance of sweet and tangy?! 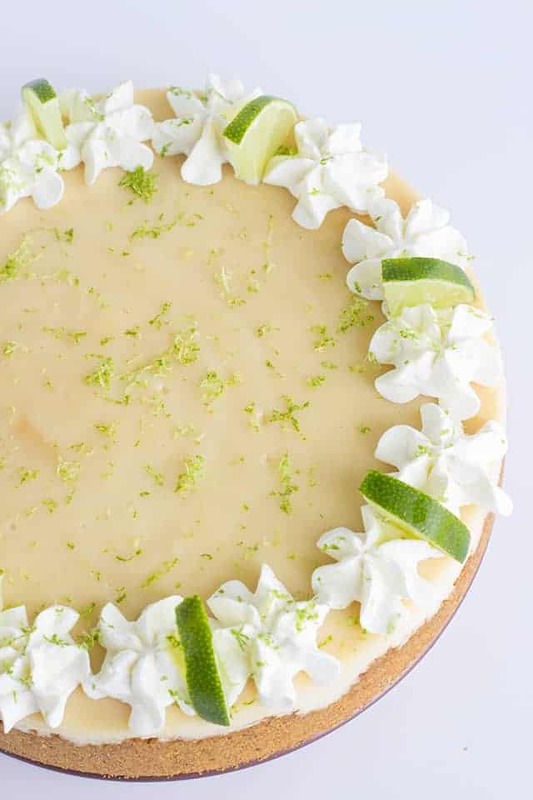 As far as the perfect summer dessert, this key lime cheesecake is the total package. In a mixing bowl, add the graham cracker crumbs, sugar, and melted butter. Stir until the butter coats all the crumbs. Press the crumbs into a 9.5-inch springform pan. Press the crumbs up the side of the pan as well as the bottom of the pan. Place in the oven and let bake for 15 minutes. In a mixing bowl, add in the cream cheese and granulated sugar. Mix until completely incorporated. Scrape the sides and bottom of the bowl and mix again to avoid any lumps of cream cheese in your batter. Add in the eggs one at a time. Mix each egg completely before adding the next. Scrape down the bowl after adding each egg. Add in the key lime juice and sweetened condensed milk. Mix until incorporated. Line the outside of the springform pan with heavy duty tin foil. I double wrap it to prevent the water from leaking in. Pour the cheesecake filling into the cooled crust. Place the springform pan in a slightly larger baking pan. Fill the outer pan with about an inch of water. Place in the oven at 325 degrees and let bake for 1 hour and 15 minutes or until done. To make sure the cheesecake is done, gently give it a wiggle. If it slightly jiggles in JUST the middle like jello, then it's done. If it jiggles all over, it needs to bake longer. Turn off the heat and crack the oven door slightly. Let it cool in the oven for an hour or two. I kept mine in the oven for about 2 and half hours and then placed it in the fridge. In a mixing bowl, add in the heavy cream. Beat until soft peaks form. Add in the powdered sugar. Continue to beat until it becomes thick. Add the whipped cream into a piping bag with a 1M tip. Pipe the whipped cream on top of the cheesecake. Sprinkle the zest on top of the cheesecake. 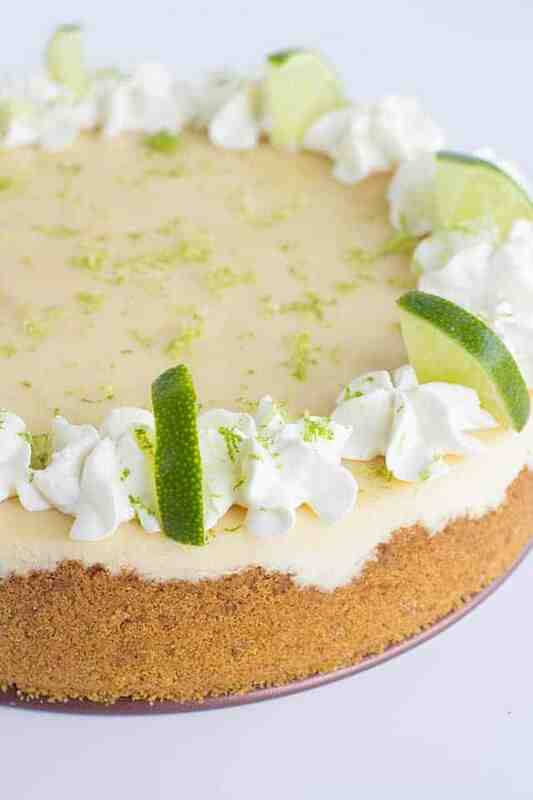 Add the quartered pieces of lime in between the swirls of whipped cream. If the limes are damp, dry them off before adding them to the whipped cream.